Common law defines burglary as any unlawful entry into a private home or other building. The intention of the burglar is usually to steal or burgle. Sometimes, however, other more sinister criminal acts may occur (see below). These could include hurting someone or causing deliberate damage. Being “burgled” is something I have experienced firsthand on two separate occasions. The effect a home break-in can have on its victims can be devastating whether they’re home at the time or not. I got over the first break-in pretty fast. I was also quick to take extra precautions and install burglar deterrents. Sadly for my wife, recovery took considerably longer. My reason for writing this piece, and other pieces on the site, is so that you can identify and profile the different types of burglars and break-ins. This in turn will help you to better understand motivations. It will allow you to identify any weaknesses in your safety and security precautions. This way you get to make better informed decisions for securing your own property. There are four basic types of burglary and four different types of burglar. OK, let’s begin by identifying the four types of burglary starting with the simple break-in. This is basically the act of someone entering any kind of structure without any formal or informal permission. It doesn’t matter if the structure is locked or unlocked; entry without permission is illegal. A simple break-in like this is often, though not always, performed by an opportunist burglar. Their intent is to steal something, anything, from inside the structure. Whether the theft is big and bold or small and insignificant, this is still an offence that can send the thief to jail. No type of burglary is nice, but aggravated burglary is a particularly nasty business. Like the simple burglary above, the criminal gains unlawful access by breaking into the structure (entry without permission). The difference between this and the simple burglary is the intruder. In this case they will inflict harm if they come across someone or some people who confront them. The burglar will often carry an offensive weapon. Other times they will be confident just to use physical force like their fists and feet to harm those inside if challenged. This is the “aggravating element.” It’s a serious offence, and one that can lock the thug away for many years, decades in some cases. How long they get (if caught and convicted) depends on the severity of the aggravation. The home invasion is an even nastier act than aggravated burglary. The reason I say this is because those who break in know that there is at least one individual inside the structure. That’s why they are there. In these cases the criminal act is predetermined. With the home invasion the burglar has every intention to use violent means against those in the structure if they need to. They may also have intentions to smash the place up depending on their reasons for being there. Such ordeals could be over within minutes or go on for some hours. In extreme cases, a home invasion may last for days, contingent on the criminal’s demands. Looting in and of itself is a horrible crime. Oftentimes the looter takes advantage of other people’s misfortune. In fact, when opportunity occurs, looters can take on almost any form and be of any gender. They can be a mix of high school students, family folks (especially the poor) and common thugs. The key point here is that people won’t be worried about alarms going off because they don’t believe the police will respond because they will be too busy dealing with other matters. Natural disasters, e.g., flash flooding, earthquakes, hurricanes, etc. Not all looters are typical criminals. Oftentimes a looting spree will include folks who are normally law-abiding citizens. There is something that happens when a looting opportunity presents itself. It’s almost as if a switch goes on inside the heads of “some” people. Once triggered, it turns them from goodie to baddie in an instant. Experts don’t fully understand why or even how people can switch like this. After the event, even the otherwise law abiding citizens find it hard to comprehend what they just did. One thought is that looting makes poor powerless people suddenly feel as though they have great power. It’s hard to explain. Psychologists suggest that going from a feeling of powerlessness to one that is all-powerful can be incredibly intoxicating. OK, that’s the four basic types of burglary. Now let me explain the four types of burglar. The amateur or common burglar is often a simple one too. They’re not all that savvy and are more likely to get caught red handed than the other three types. They’re still a menace to society and can cause a lot of distress with their opportunistic style of break-ins. They usually just walk around looking for an easy target such as an open window, unlocked doors or ladders and climb on the roof to get into a loft window. They’re more your smash & grab type to be honest. That doesn’t mean they can’t escape with some very valuable or sentimental items because they can and they do. They don’t usually have buyer’s waiting either. They will sell whatever they’ve nicked at a ridiculous price just to get shot of it. The hunter burglar is a planner more so than an opportunist. Sadly they are very common and I know now that we were the victims of the hunter burglar type on both occasions. What they do is scout around neighborhoods casing out places of interest, often taking notes of unprotected homes, for example, no home security system like outdoor video cameras and lighting. Over the course of a few days or week, they could have a shortlist of potential targets. They know what time people leave the building, the hours of day or night it’s unoccupied, and the best way to gain access. The hunter prefers to access through unlocked doors or windows, but they will break-in and use brute force to enter if they have to. They don’t usually know what they’re going to find and will just rob anything of apparent value. My wife and I have never left any unlocked doors or windows open. In our second break-in the burglar simply removed the entire window frame and climbed in through the huge aperture. The prowler burglar is a smarter version of the hunter. In fact, they probably moved up to prowler status after a string of successful break-ins as a hunter. The main difference here is that they target a structure knowing what it is they intend to rob. Unlike the hunter, the prowler already has a buyer for their loot. Or at the very least they know they can shift their swag quickly and easily. As the name suggests, the specialist burglar is someone who is more skilled and at the top of their game. They don’t scratch around or waste time with poor to average pickings. These are the guys who only work at the top end, where the real money is. They hang around the better side of town, casing up luxury homes, making sure they select their targets with the utmost care. Quite often they are a part of a much bigger and very well oiled crime ring. They not only target homes, but high end cars, boats, businesses and warehouses packed out with quality merchandise. 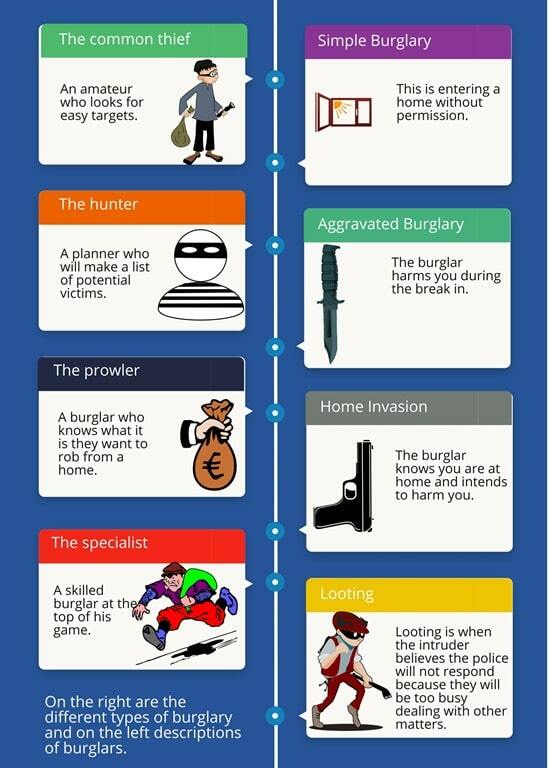 Sadly there is no shortage of any of these four burglar types in modern society. That’s the bad news. The better news is that there are plenty of things you can do to protect yourself and your loved ones. In the US alone there is an average of 2,000,000 reported burglaries every single year. There will be many more, minor incidences that go unreported.